In its Calendar Live section, the Los Angeles Times featured a Sunday Conversation with Rachael Ray. After the usual introductory stuff (which you should read if you are just learning about Rachael Ray! 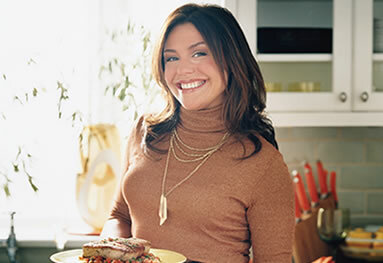 ), Lynn Smith offers this description of Rachael: "More of a conglomerate than a host, Ray, 38, has also written 16 books and launched her own magazine, Every Day With Rachael Ray, attracting ever more fans to her hyper-enthusiastic, seize-the-day message delivered in a gravelly, sorority-girl voice, as well as drawing complaints that she has diminished the world of television chefs with fluff, nonsense and simple-minded advice." Geez that was a long sentence. And pretty stupid, too. (Tell us how you really feel, Madeline). I was a sorority girl (ducking for cover) and I can tell you that of all the sorority girls I knew, none had gravelly voices. Does anyone associate gravelly voices with sorority girls? Ummm, no. And for God's sake, why perpetuate the "she's a chef who is bringing down all other chefs" thing? How many times does the woman have to say she's not a chef before people start listening?
. There are people who find peace and satisfaction in making simple meals that are pleasing to the palate and the eye. And other people who really enjoy the tradition and complexities of grand cuisine. There's room for everybody. Omigod, that's such a huge difference, it's crazy. People thought I was peppy before? At home I'm extremely quiet. At work I get hopped up telling a story. But now? It's like I'm on crack. With all those people there? Like 120 new people every few hours? All those I-can't-stand-Rachael Ray people, I must have sent them into shock. They must have gone into seizures. I'm trying to calm down a little bit. Check out the full article to see what Rachael thinks of the criticism aimed at her, what her business plan is and her opinion on what viewers really want. Keep and eye out for the Rachael Ray Roundup today! I almost was a sorority girl. My dad couldn't afford the dues so I didn't go there. What sorority did you belong to? I was looking at Tri Delta. I still can't believe Rachael is 38. She doesn't even look it. I was (I should say am, but I just can't) an Alpha Delta Pi. We didn't have a house on campus, so the dues were a lot less than at most schools. And yeah, Rachael definitely looks good. However, I do have to say that her voice has smoker written all over it. I quit at the beginning of the year, so I won't be judgmental, but man it's making her voice hoarse (if she is a smoker, from what I read, she is).